The dam's temperature had dropped on Saturday to a low of 98° F. The dam was calm, panting and dilating all night and there was no green discharge. The pups were expected Saturday night, but no pups came. At 7:00 a.m. she was weakly pushing. 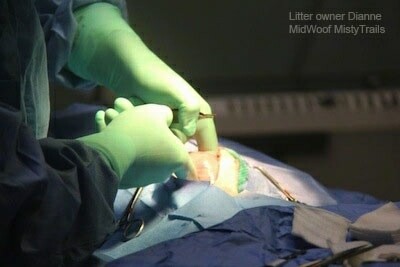 At 9:00 a.m. an internal exam showed a puppy's tail in the birth canal. The dam worked on getting this puppy out from 9:30 a.m. to 12:30 p.m. with the help of our feathering. 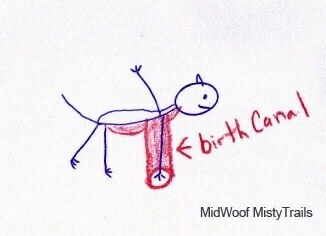 She just didn't have the push to get the pup’s big hips past the birth canal. This was a big puppy. NEVER give oxytocin without a vet or without knowing what you are doing. We gave 3cc of oxytocin with the vet on the line with us. 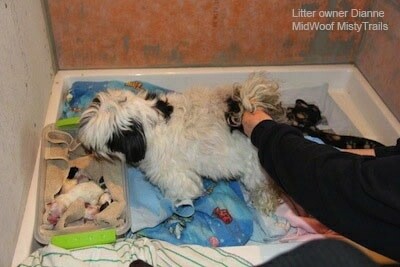 It was made VERY clear to us and to the vet that the pup’s tail was presenting and BOTH back thighs were bent upwards. This is important, as you CANNOT give oxytocin if the pup is lying sideways across the birth canal. You MUST be 100% sure why the pup was stuck. We knew the pup was able to come out. We had it lined up and I just needed a booster push. 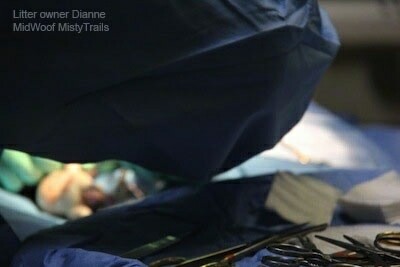 If the pup had one leg out, a tail, or if the pup was sideways and wasn't able to come out, giving the oxy would be very dangerous, because the dam is not able to push the pup out the birth canal and she can push the side wall of her uterus out. 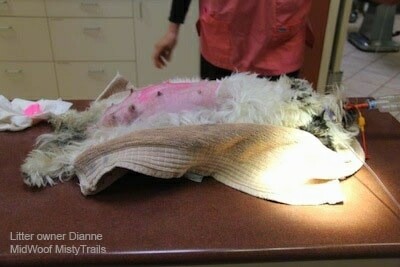 Ten minutes after the oxy shot was given, the dam pushed and we were able to dig out the legs and pull the puppy out. It required a lot of our help. 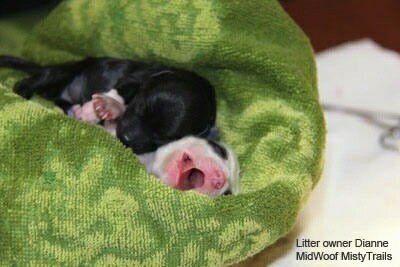 At 12:30 p.m. the first born puppy was born. 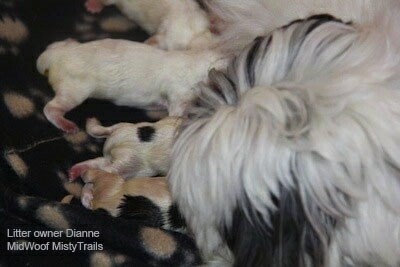 The second and third puppies were born 20 minutes apart. 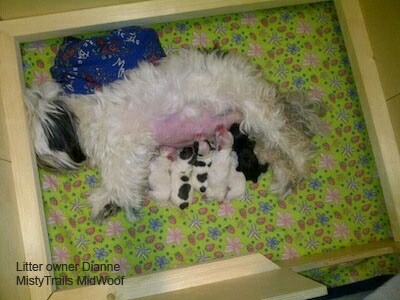 At 1:20 p.m. the fourth puppy was born. The dam then shut down. 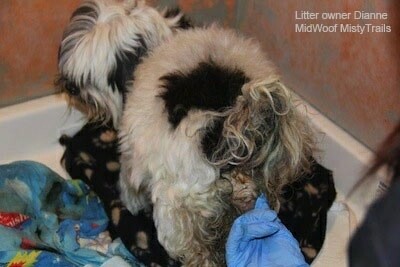 She drank water and ate, but because we had done an x-ray on day 56 we knew there was still a puppy in there. We took her out to potty with a small walk trying to get the puppy to move down. We feathered her over and over trying to stimulate a contraction. Nothing, there were no contractions. We could not get her labor started again, yet we knew there was still a puppy in there. It was now 3:20 p.m. 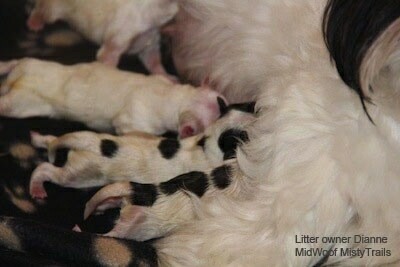 The puppies that were already born were doing well. We decided to give another oxytocin shot since nothing was blocking the birth canal. 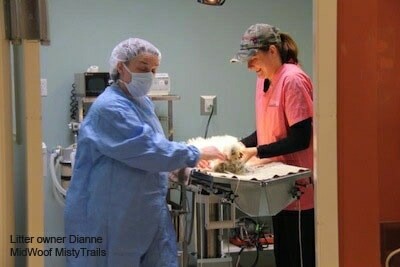 We often give an oxytocin shot to get the last puppy out if the dam is tired. We always give the shot anyway after the last puppy comes out, as a clean-out shot. It also helps bring in the milk. At 3:30 p.m. we were presented with a foot. Just one foot! We were able to grab onto this foot and pull slightly. There was no progress for 15 minutes; just a foot and no sac. 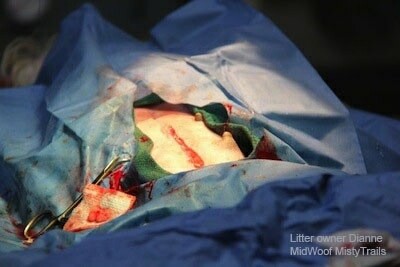 I was the “midwoof” for this litter and this is when I told the owner to call the vet and arrange a C-section. It was now about 4:00 p.m. This pup was still alive. At the time I didn't tell the owner this, as I was not sure that we would be able to get the pup out in time to save its life. One thing I knew for sure was this pup was NOT coming out through the birth canal. I saw a dewclaw on the foot. This told me there was a 95% chance the foot we were seeing was the front leg/foot that was already out of the sac. This means one foot was in the birth canal, and the head was to the side with the body to the other side. The pup is trying to come out the birth canal sideways. In this position it cannot turn, as the leg and shoulder are in the birth canal. After we did the internal we discovered that we could only feel a leg with no thighs and no tail. 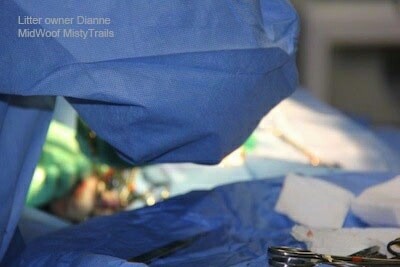 This was NOT a time to give oxytocin, as we knew the puppy cannot come out. We had called the vet earlier and had her on call. Everyone was ready to go when we got there. 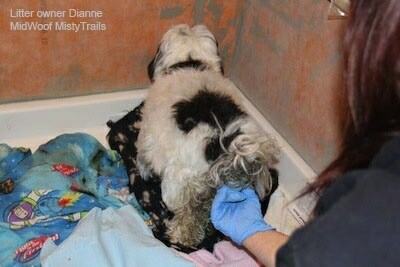 We had the owner, the dam, the vet and the vet tech ready to go and the dam was put under. 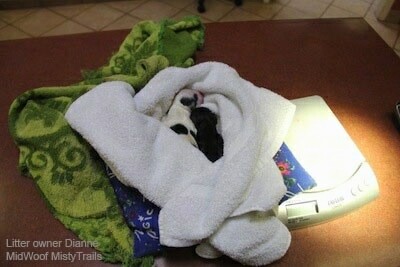 There was no attempt to get the puppy out through the birth canal, no more oxytocin. The vet agreed the pup was not coming out. We were playing a time game now. It was very important this all happened quickly or the puppy would not make it for sure. The dam was prepped immediately and the section was started. 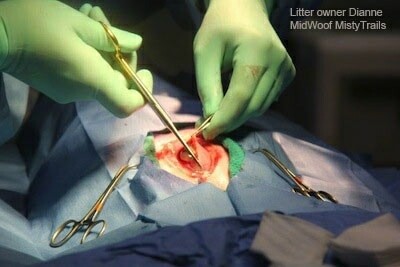 The incision was made and the vet began to pull out the puppy which was inside the uterine horn. 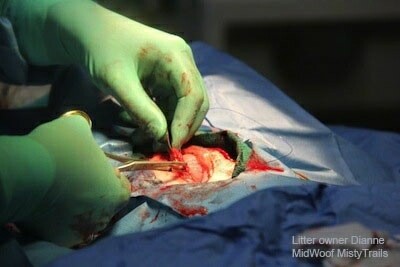 Cutting into the uterine horn, the puppy was almost out. The problem puppy was out. It was 170g, limp, white and lifeless. We had to do CPR along with a few gravity drops. We put some stuff under his tongue and rubbed and rubbed. We did some chest compression along with massage. After several minutes we got a gasp! He was revivable. YIPPEE! 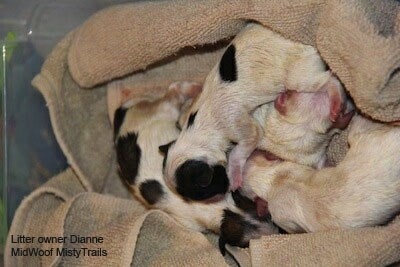 Then came surprise puppy six! It was a smaller black girl that weighed 120g. She took a little more to revive. After about 10 minutes we got a gasp! Both of these puppies were dying and in a lot of stress. If the C-section was put off another 15 minutes or more I do not think they would have been revivable. 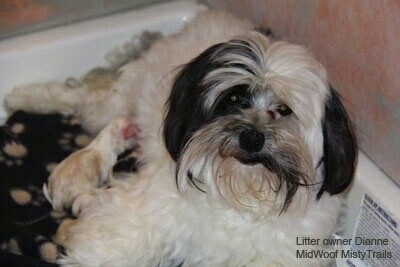 These are the two pups that were saved by the C-section and the CPR. The dam must be stitched back up. 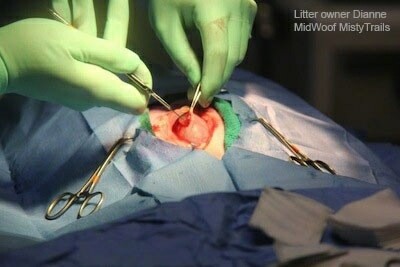 It is very important to put in a lot of internal stiches so she cannot open herself up. The vet stitching the dam back up. 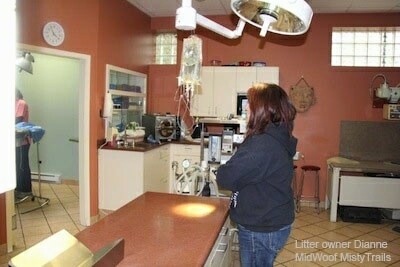 If we had not done an x-ray we would have had no way of knowing if all of the puppies were out or not. After the fourth puppy had been out the dam drank and ate as if she was all done. We knew better however to get an x-ray. We knew that it was important to know how many puppies were inside of the dam. 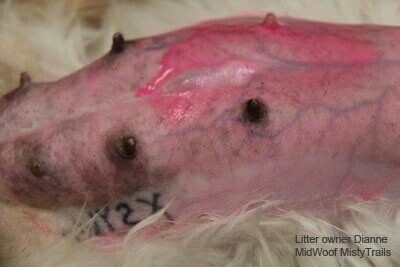 An x-ray can also tell you the status of the pups. Had we not known there were more puppies in there, there would have been two dead puppies left in the dam and this would have been a not-so-happy ending. 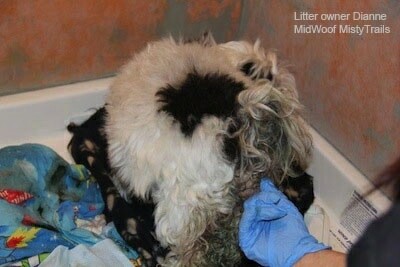 Not only would the pups have died but the dam could have died as well. 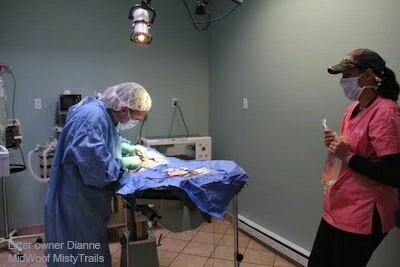 Thank you to our absolutely awesome vet and her helper. We are very grateful for them and glad we as breeders had the experience to help us know what to do in this situation. 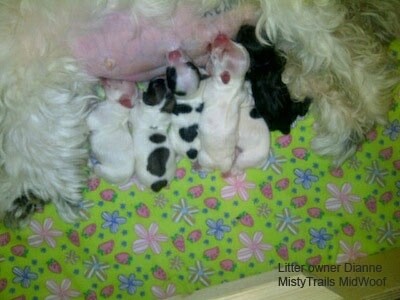 The owner is blessed with six healthy puppies and the dam is doing great. The dam and her puppies are home safe. We need to keep the mom warm as well as her puppies. She has two heating pads below her and the room heat is on high.